At Bernie’s Towing, customer satisfaction is our top priority. Our goal is to deliver quality towing and roadside assistance services that will exceed our customer’s expectations. It is our duty and pleasure to provide fast, friendly, and reliable service for motorists, using only the latest in towing technology, as well as knowing our way around the Greater Chicago area so we can respond quickly to your emergency needs. For a free quote and Immediate Service call us anytime of day or night at (708) 405-9900. Call Bernie’s Towing on (708) 405-9900 any hour or day of the week, rain or shine, anywhere in the greater Chicago area, and in any emergency road side situation. We will help you get you and your car back on the road to safety. 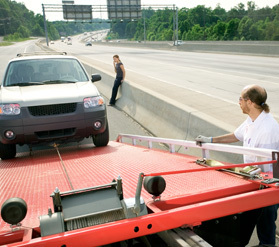 Our well maintained tow trucks and trained towing professionals are ready now. Our experienced towers have handled just about every instance of automotive and towing related issues. They are never at a loss when it comes to servicing a car; and you’ll never be at a loss when you have the number of our knowledgeable towing experts handy in any emergency. You’ll find that you can’t go wrong when you hire Bernie’s Towing. We are the right towing authorities for any job and we won’t keep you waiting! The road sometimes throws unexpected curves in a motorist’s path, so keep our phone number handy and be prepared for anything. We have all been there; in the middle of nowhere on a straight stretch of road when the car unexpectedly overheats. Maybe you were running errands and you accidently locked your keys in the car or kept telling yourself you would fill up after the next errand and before you knew it you had run out of gas. Perhaps it was on a busy freeway when you ran over a sharp object and a tire went flat. No matter what your roadside emergency, there is no need to worry. Bernie’s Towing will rescue you from all the unpleasantness of being stuck on the side of the road. If you need towing or roadside assistance services, contact us today! Our experienced tow truck drivers can handle all your towing needs, no matter how big or how small they may be; local or long distance, flatbed or wheel lift, emergency or otherwise. Our helpful dispatchers and knowledgeable drivers always go the extra mile for you! Our emergency roadside assistance services include everything from air delivery and tire changes when you get a flat tire, fuel delivery when you run out of gas, a jumpstart or battery replacement when your battery dies and an auto lockout when you accidently lock your keys in your car. Bernie’s Towing pays cash on the spot for junk cars. It doesn’t matter how old or what condition your car is in – wrecked or not wrecked, running or not running, title or no title, our experienced valuation specialists will pay you more for your junk car – and tow it away for free!